A lot of how you respond to Guy Richie’s stylish take on “The Man from U.N.C.L.E.” has to do with what you go in expecting. If you’re anticipating the gadgetry of retro Bond, the action adventure of the “Bourne” franchise, the stunts of “Mission: Impossible” and the bromance of Richie’s “Sherlock Holmes” movies, you will not find much of that here. Nor, if you do a little research, will you find much similarity to the 60s TV show from which the movie takes its name. In comparison to the film adaption of “The Lone Ranger” (which coincidentally also starred Armie Hammer), “U.N.C.L.E.” is not even a smidge as inflammatory or insulting to its source material. Contradictory to the catastrophe that was “Lone Ranger”, “U.N.C.L.E.” presents its send-up with a far more celebratory spirit and its infectious energy keeps the movie afloat, even as it hits the choppy waters of some overused gags that grow tired fast. 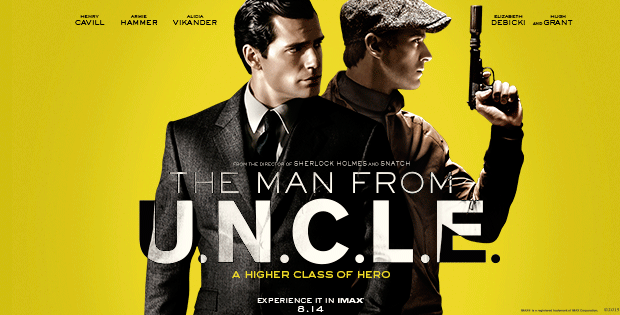 Set in 1963, the story revolves around rival spies; American CIA agent Napoleon Solo (Henry Cavill) and Russian KGB operative Illya Kuryakin (Armie Hammer) as they reluctantly join forces to stop a shadow organization from procuring a nuclear weapon. Crucial to their plan and along for the ride is East Berlin mechanic Gaby Teller (Alicia Vikander); whose scientist father is being used by the group to create the WMD. Let the double crosses, questionable allegiances and adversarial repartee begin. On paper, two dueling agents from opposing countries with vastly different approaches to field work should make for a crackling combination. While the two spar, their buddy relationship remains stagnant. They only manage to tolerate each other; never developing the common respect or admiration for each other that other films such as “Shanghai Noon” have terrifically brought to bear. More successfully realized is Alicia Vikander’s Gabby, who is seamlessly woven into the fabric of the central duo’s dynamic and the movie's boys' club atmosphere in a believable way that avoids feeling obligatory. Utilized to much lesser effect is Hugh Grant’s Waverly, a role that ultimately amounts to an estimated five minutes of screen time for the veteran thesp; a greatly disappointing choice. While subtle in how it goes about it, "U.N.C.L.E." seems to take sides in the old Cold War rivalry. Clues to where its loyalties lie rests with some key plot points. Solo goes from being an upstanding voluntary agent in the TV series to having a movie backstory as a criminal rogue, who was forced into using his powers for US interests. Kuryakin on the other hand is a noble guy working to redeem his family’s name following his parents’ scandalous downfall. His worst attribute is a short temper that doesn’t suffer fools or villains; which isn’t really a bad trait. If “U.N.C.L.E.” is trying to repair the bad blood stirred by “Child 44” it makes a sufficient dent in cleansing the murky waters. Current “Superman” Henry Cavill gives a mischievously sly and debonair performance as Solo; affecting an American accent that is a dead ringer for the leading man brogue of golden era Hollywood. Co-star Armie Hammer gives his best turn to date, though his screen presence tends to be a mismatch for the material. As the hot blooded Kuryakin, Hammer’s on-screen persona as a good guy is so overwhelming that is doesn’t quite transmit the threatening nature of the character he’s trying to present. Central to the movie is the relationship between Solo and Kuryakin, a bromance for the ages. Sadly, Cavill and Hammer don’t strike a chord as buddies and their chemistry as adversaries doesn’t fare much better. The script keeps both actors so preoccupied playing their roles as separate entities that when it comes time for the two to commingle, nothing complimentary manifests. Highly impressive is the performance of rising star Alicia Vikander who demonstrates her versatility in a significant departure from her role in “Ex Machina”. Feisty, quirky and with the appropriate air of mystique, Vikander makes an impression as the precocious Gaby. The only minor drawback to her turn is an inconsistent accent that oscillates between German, Swedish and American before falling into a mash-up of the three. Her turn as a whole more than makes up for this small fumble though. More than paying homage to its namesake, “U.N.C.L.E” is a good-natured tip of the hat to 60s spy movies and the mystery classics of the 50s, with strands of “To Catch a Thief” and “Charade” coming through the most. The direction, cinematography, costuming, music and the cast’s performances never stray far from the vein of its time period. There’s nothing that screams millennium here and that is both a bold choice that pays off with its throwback zing and a slight hindrance to its feeling daring. There’s a constant feeling that we’ve seen all of this before and executed to better effect.